It’s rare in today’s way-too-busy world to receive a thank-you note – especially from a younger to an elder. So John Paris, Jr., was pleasantly surprised and gratified when he recently received a message of appreciation via Facebook from Uriah Jones, thanking him for making hockey history. 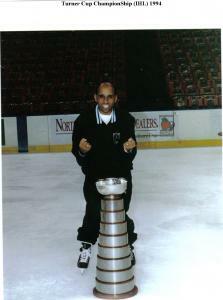 In 1994, Paris guided the now-defunct Atlanta Knights to the International Hockey League championship and became the first black coach in professional hockey to win a title. Jones, an Atlanta native who works for the Chicago Blackhawks’ youth hockey program, wanted Paris to know what that feat meant to him. Former Atlanta Knights Coach John Paris, Jr.
Jones’ note filled Paris with pride, all 5-foot-5 inches of him. He said he’s the thankful one for being remembered and being a role model for someone looking to make hockey a career. “I should be thanking him because if he’s working within the (Blackhawks) organization regardless of whatever the role he’s in – if he saw me doing it and that pushed him to do it, the credit goes to him because he had enough gumption to get up, go out and get the job,” Paris told me. It doesn’t seem like nearly two decades since he took the Tampa Bay Lightning farm team stocked with young players and seasoned veterans to the IHL’s Turner Cup, Paris said. And it didn’t feel like history in the making when the game clock hit zero and the Knights dispatched the Fort Wayne Komets 4 games to 2 to win the trophy. But it was slow in opening. Paris, 67, grew up playing hockey in Windsor Nova Scotia. Uriah Jones was inspired by Paris and aspires to make hockey a career. He played on teams in Quebec’s junior and senior league teams, and played nine games for the Knoxville Knights in the old Eastern Hockey League before shifting to coaching. He became the first black head coach in the Quebec Major Junior Hockey League, piloting the Trois Rivière Draveurs and Granby Bisons. But coaching in Quebec – the province where baseball’s Jackie Robinson played before joining the Brooklyn Dodgers – and in the IHL wasn’t a walk in the park. He was spat upon by fans, had coins thrown at him and the N-word spewed at him. Hate mail and death threats weren’t uncommon. But the abuse didn’t deter Paris. After winning the Turner Cup, Paris went on to coach the IHL’s Macon Whoopee, and later moved to piloting junior teams. Last season he coached the Omaha Lancers, an AAA Under 18 team. These days Paris is living in Irving, Texas, penning his hockey memoir and developing a program to improve youth hockey coaching, and catching NHL games on TV. He likes what’s transpired in the game after his historic championship: former Chicago Blackhawks forward Dirk Graham becoming the first player of African decent to coach an National Hockey League team and black players like Bryce Salvador of the New Jersey Devils and Jarome Iginla – formerly of the Calgary Flames, now of the Boston Bruins – having the captain’s “C” sewn onto their jerseys. He enjoys watching an ever-growing group of minority players like forwards Wayne Simmonds of the Philadelphia Flyers, Nazem Kadri of the Toronto Maple Leafs, Emerson Etem and Devante Smith-Pelly of the Anaheim Ducks and defenseman P.K. Subban of the Montreal Canadiens and Seth Jones of the Nashville Predators not only surviving but thriving in the league. And Paris loves watching Kevin Weekes, David Amber, Anson Carter and others talking hockey on “Hockey Night in Canada,” NHL Network and NBC Sports, proving to audiences that minorities in hockey is the new normal. “Kevin Weekes on TV has opened a whole vast new arena,” he said. 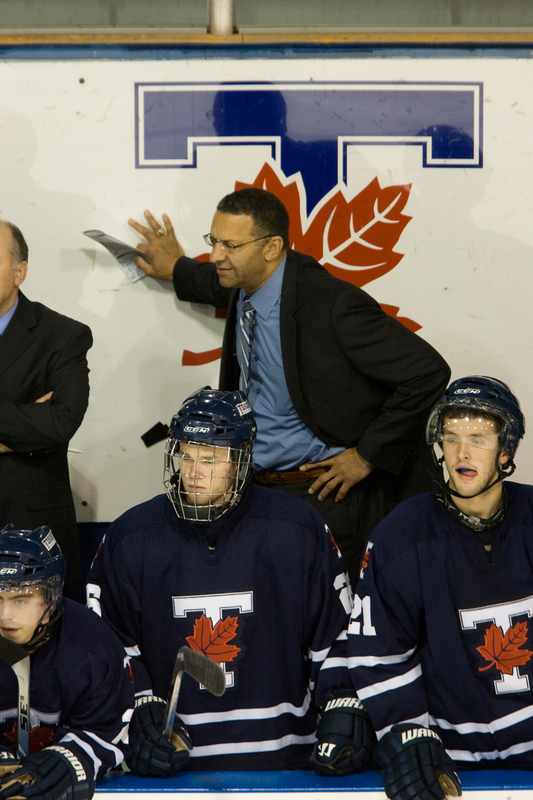 Paris hopes to see more coaches like the University of Toronto’s Darren Lowe. Paris says the next phase is to get more minorities behind the bench and in the front offices of hockey teams. They have been few minority coaches in the NHL. Craig Berube, of Native American/First Nation roots, was recently named coach of the Philadelphia Flyers; Graham led the Blackhawks during the 1998-99 season; Ted Nolan, an Ojibwa Native American/First Nation steered the Buffalo Sabres from 1995 to 1997; and Darren Lowe, the first black to play on a Canadian Olympic hockey team, has coached the University of Toronto Varsity Blues since the 1995-96 season. And Paris hopes that Uriah Jones will someday be part of that progression. Jones, 31, says he got hooked on hockey the minute he started playing floor hockey in Georgia. He eventually progressed to ice and played on suburban Atlanta’s Life University hockey team, a Division 3 American Collegiate Hockey Association club team coached by former Atlanta Flames goaltender Dan Bouchard. He landed a job in the hockey development department of the Atlanta Thrashers, helping to grow the sport in the Peach State. But the job ended when the Thrashers moved to Winnipeg and became the Jets. Hockey may have left Atlanta but it didn’t leave Jones. After the Thrashers up and left, Jones packed his bags – for Chicago. There, he found work with the National Basketball Association Chicago Bulls on their equipment staff. With the Bulls sharing Chicago’s United Center with the Blackhawks, Jones inquired through NHL headquarters in New York and friends in the hockey world about whether there were any job opportunities with the team. The Blackhawks hired him shortly after last season’s player lockout. 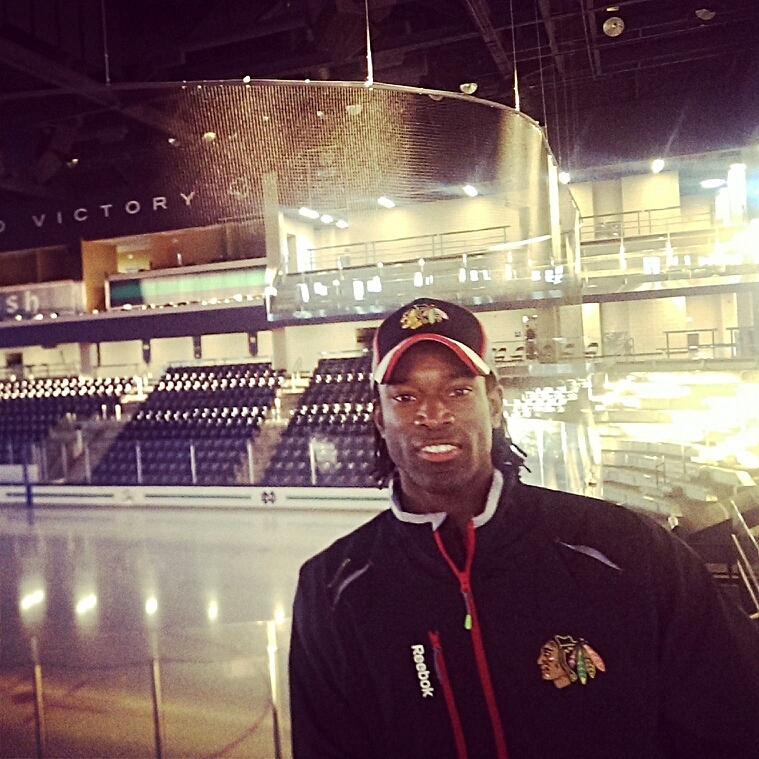 To say that Jones is in hockey heaven working for the Blackhawks is an understatement. And that makes John Paris, Jr., happy.